Many drivers who own expensive or classic cars may be thinking about avoiding the hazards of winter weather by parking their car until spring. This article provides some tips on proper winter storage. Many older vehicles in particular may be susceptible to rust if driven on roads that have been treated with salt. Additionally, such vehicles may not be the safest mode of transportation given the advances in auto safety technology in recent years. While storing a car is a viable option, there are specific procedures that must be followed in order to avoid long term damage. 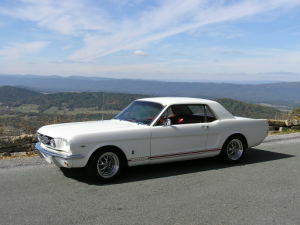 I have stored my 1965 Mustang GT for the past three winters using the steps listed below. Fuel that sits in a gas tank for extended periods can degrade and result in gum and varnish deposits. This can have a negative impact on all vehicles, but particularly on older cars that use carburetors. To avoid such problems, fuel stabilizer products such as Stabil can be added to a tank of gas and will preserve the freshness of the fuel for up to one year. Prior to pumping gas, add the recommended amount of Stabil to the tank and then fill it up as usual. Be sure to drive at least ten miles to ensure that the treated fuel makes it through the entire fuel system. After driving home from the gas station, drain your old motor oil and remove the filter. Install a new filter and add fresh oil. This is critical even if you have not driven the manufacturer’s recommended mileage between oil change intervals. You do not want used oil with impurities to coat your engine’s internal parts during storage. An oil change is cheap and quick to perform. It is critical to wash, wax, and fully detail the car prior to storage. This is more than a fifteen minute car wash. Ideally, you should wash the car and then use a clay bar product to remove paint impurities. This should be followed by a complete wax job using a high quality product like Meguiars. Be sure to clean the door jambs as well as any painted surface under the hood or trunk. The interior should be thoroughly vacuumed and detailed with a product such as Armor All or a quality leather cleaner. After this process is complete, drive the car for a mile or so to air dry the undercarriage. Ideally, you should have a secure heated garage where your car can be safely parked for the winter. However, few of us are lucky enough to have a heated garage. For unheated garages, place a tarp on the garage floor and secure it with duct tape. Drive the car over the tarp which will act as a moisture barrier. Be sure that the garage is clean and sealed from rodents that might want to enter and use your car as a winter nest. Many owners prefer to elevate the car on jack stands for extended storage. This eliminates the possibility of “flat spots” forming on the tires and relieves pressure on the suspension. For shorter storage periods of up to three months, I have used the following method as an alternative to jack stands: Over inflate the tires to at least 40 psi. Then, remember to roll the car forward or back once every few weeks to avoid tire flat spots. While not ideal, this approach has been viable for my purposes. If a battery is not attached to a battery tender/charger for an extended period, it will drain and you will be unable to start your car in the spring. In addition, this type of discharge can be harmful to the life of the battery. To avoid this problem, remove the battery from the car and attach it to a battery charger such as this Black & Decker unit which I use. Finally, if you have a high quality car cover, place it over the car to protect it from dust or other damage while in storage. If you do not have a high quality cover, do not attempt to use a cheap tarp instead since this can damage the paint. When you are ready to get back on the road, replace the battery, lower the car from the jack stands and verify tire pressure, and perform a visual inspection of the vehicle including examination of all fluid levels. If you are not comfortable doing this yourself, a mechanic should inspect the car for you since an inspection is critical for your safety. This is also a good time to perform other routine maintenance such as flushing the cooling system if your car is due for the service. Prior to cranking the engine, it is important to distribute oil throughout the engine to avoid a “dry start” that could damage the engine. After months of storage, oil that normally coats the engine will have drained into the pan. To do this, either purchase an oil pump primer which can be used to spin the oil pump manually or pull the coil wire and crank the engine (which will turn but not start). This will distribute oil and reduce the risk of damage when the engine starts for the first time after storage.